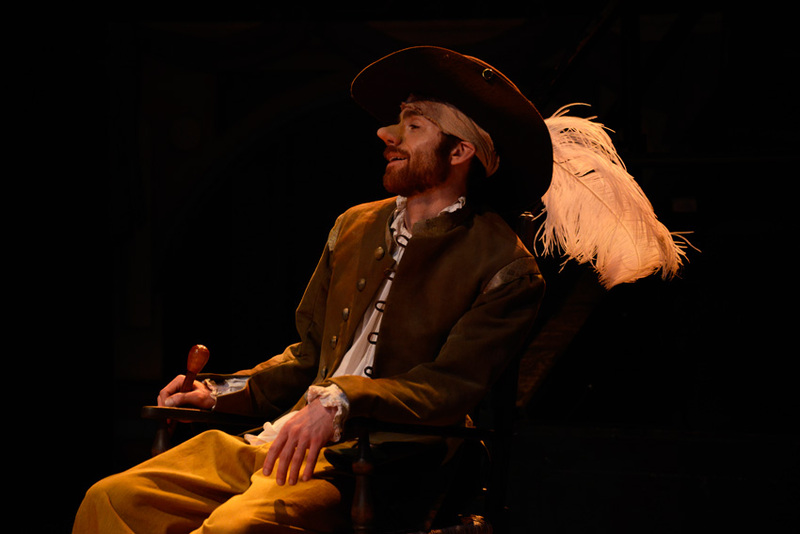 Review: Cyrano at Derby Theatre by Northern Broadsides and New Vic Theatre – East Midlands Theatre. As classic romantic comedies go, the sublimely witty story of Cyrano De Bergerac is one of the world’s most popular. This splendid adaptation by Deborah McAndrew has its heart in the romance with its rapier sharp humour and thrust in the form of a bawdy, witty and very engaging romp. This reviewer is finding himself becoming ridiculously poetic. The costumes and set are top notch and we are in the soil of 17th Century France before the play even starts. The off stage announcer even asks that mobile phones be kindly turned off as they haven’t been invented in this period. The clever language of the text by McAndrew brings the story bursting to life in the most delightful and totally accessible way. We can be witness to the straight-talking of the soldiers and the people of the rough streets or be carried into jocular ecstasies by the boisterous humour of Raveneau’s pastry and poetry filled bakery. 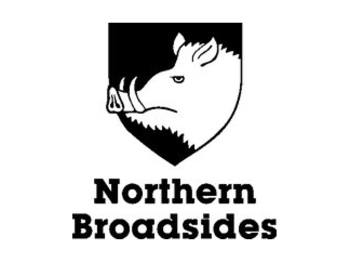 Eh alors mes amis, all of the characters parlez in typical Northern Broadsides manner – i.e. they talk in a Yorkshire accent and it works exceedingly well. Parfois, (sometimes me ode) the piece can suddenly become beautifully poetic but never ever too densely floral. Like an excellent, deeply hued and nuanced Gascon wine, this is Cyrano’s poetry of the terrior humane: flint gritty but stealing the fainting heart as it trips across the accepting tongue, pauses for consideration and rests deep in the soul, forever. Cyrano’s verbal parries shoot from his soldier’s mouth with impressive dexterous undoing, his rivals crawling wounded away as his sharp barbs hit home with a precision unmatched. Just don’t mention the nose! This utterly delightful production is predominantly youthful. 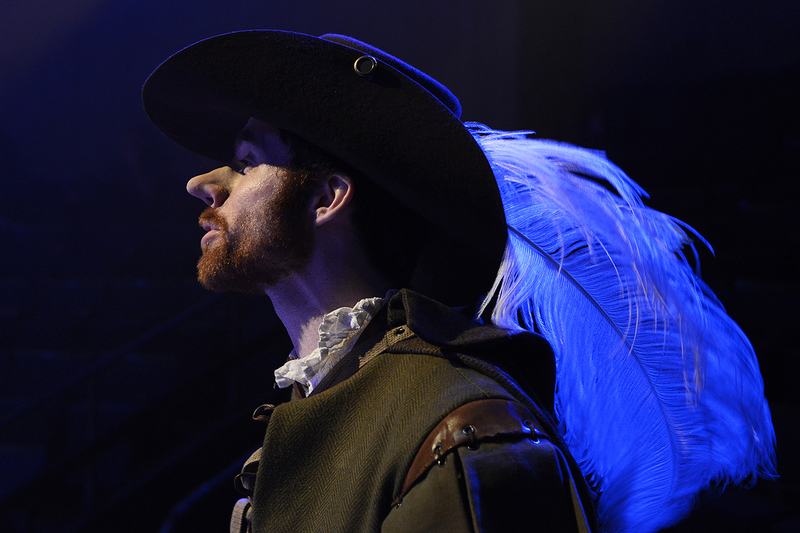 Our hero Cyrano (Christian Edwards) is cast as the same age as handsome, but witless, aristocratic soldier Christian (Adam Barlow) and the beautiful yet falsely beguiled Roxanne (Sharon Singh). In other well known productions on film, par example, Cyrano is cast as considerably older. Director Conrad Nelson’s choice in casting thus is spot on and more credible than the latter. The three principles are realistically terrific in their roles. We love the Scottish lilt of Sharon Singh’s Roxanne) There is a grounded directness in each of these actor’s delivery which allows the audience to immediately identify and sympathise with each. The wonderful main principles all bring out the bluster, confusion and naiveties of their characters excellently and the Derby theatre audience are laughing their faux Gascon garters off all the way through to the sobering end. The thirteen strong ensemble work very hard to bring the story to life and appear to be having as much fun as the audience, if not more! Creating Edmond Rostand’s 17th Century world through acting, live music and dance, and multiple characters are performers Andrew Whitehead, Andy Cryer, Paul Barnhill ( a wonderfully hearty and funny Ragueneau the baker), Angela Bain, Jessica Dyas, Anthony Hunt, Robert Wade, Perry Moore, and Michael Hugo. Finally we have the lovely (don’t blush) Francesca Mills who lights up the stage with her brilliance and comedic skills on every single entrance. They are all superb, so much so one could easily believe that there were hundreds in the cast. This is a truly superbe and very very accessible production and to miss it would be a crime. At the end a single feather may bring a grown man to tears. No spoilers ‘pour quoi’ in this review! This Derby Theatre audience are hanging on every spoken and sung word throughout. It’s reet good theatre! C’est absolument vrai. Aller le voir ce soir ! And watch out for the man in the moon! Bugger moi! Me soddin’ plume and ink’s run out! Anyone know a rhyming word for orange btw? 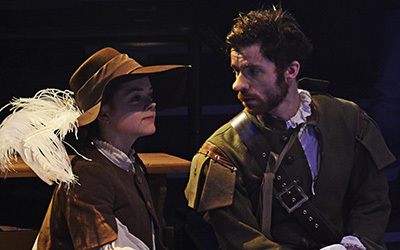 Cyrano plays (and sword fights) at Derby Theatre until Sat 20th May inc Sat mat at 2.30pm. MADD Graduate Showcase 2017. Leicester Square Theatre. London.